Yammer is enterprise social networking service used for private communication within organizations. Access to a Yammer network is determined by a user's Internet domain so that only individuals with approved email addresses may join their respective networks. Yammer can be used to discuss ideas, share updates, and crowd source answers from co-workers around the globe. Yammer gives you a faster, smarter way to connect and collaborate across your company. Deploying applications to computers would be straight forward but for applications that are user specific and installation does in %appdata% ,there will be little challenges for application detection method . Application detection is one of the main criteria to identify if the application is installed correctly or not ,also it helps to reinstall the app if the app is removed on user machine (this happens with application deployment evaluation cycle ). As i mentioned in my previous blog deploying Microsoft Onedrive using Configmgr , we will be similar method with detection rule for Yammer also. 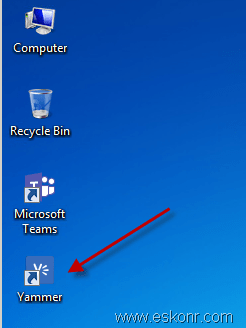 Before we start of with this ,Download Yammer client (MSI) file from https://support.office.com/en-us/article/yammer-for-windows-and-mac-50920c05-cbfc-4f11-8503-e20fb2e623a5 . Once the MSI file downloaded ,extract the file using 7zip or WinRAR to get the actual installer used to deploy to users. You will see something like below. Copy the file to your SCCM source files ,start creating Application as you do for other EXE applications. change the version value (1.3.1) name as per the application you are installing. Requirements: Windows 7,windows 10 (based on where you need this to be installed). 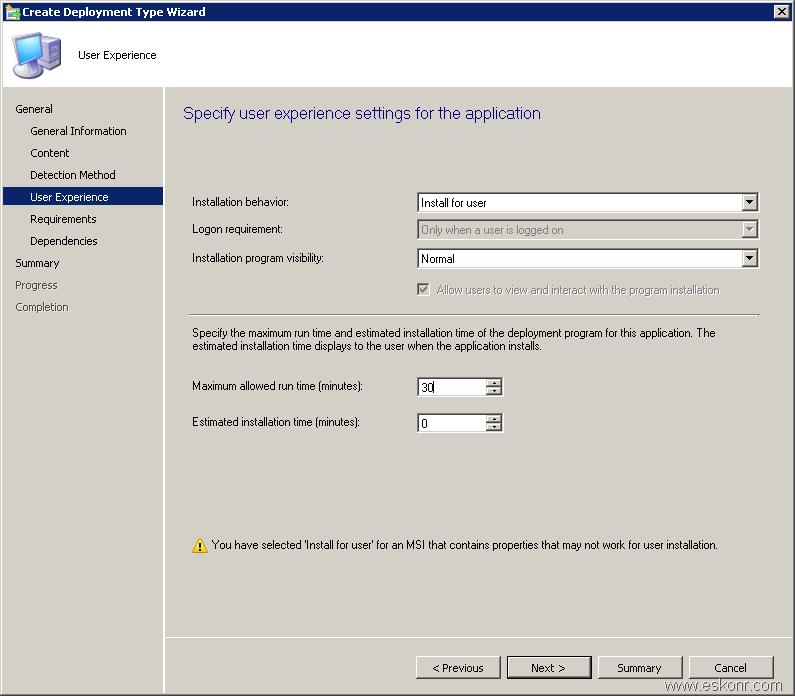 Deploy the application to user collection .So when the user receive policy (user policy evaluation cycle) ,application will get install and shortcut icon will be created on users desktop. 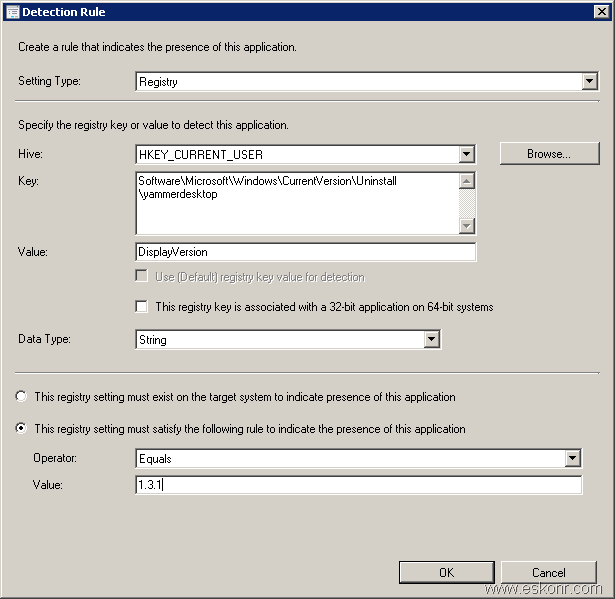 Following is the registry location that application get installed. 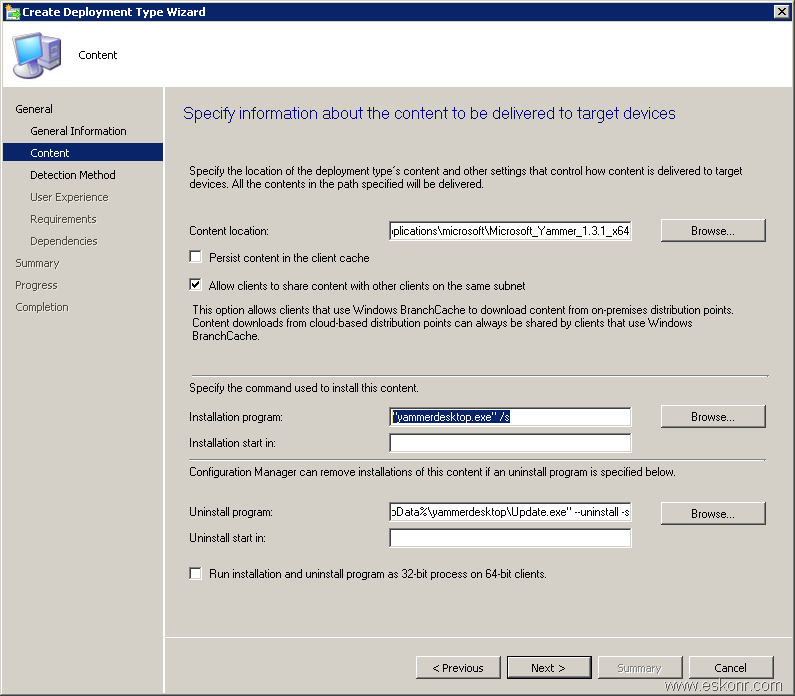 11 Responses to "How to Deploy Microsoft Yammer Client using SCCM Configmgr"
The Yammer 1.3.2 MSI files available at the link you provided are broken. All references on the internet point back to that URL. I'm not sure what else to do. They are useless. Both 32-bit and 64-bit versions have a 32-bit platform type configured in the MSI and are picked up as 32-bit packages. Then when it installs, both versions extract themselves to "Program Files (x86)" and both versions make an entry in the 32-bit HKLM\Software\Wow6432Node\Microsoft\Windows\CurrentVersion\Run referring to the executable in %Program Files%\Yammer Installer\yammerdesktop.exe which fails because the executable is NOT in Program Files, it is in Program Files (x86). This problem didn't exist with the 1.3.1 version of installers. Any ideas how to escalate this with Microsoft? It works for me .Visit https://support.office.com/en-us/article/yammer-for-windows-and-mac-50920c05-cbfc-4f11-8503-e20fb2e623a5 and look for Get the app ,you have both 32bit and 64bit for windows7+ . What is not working for you . It is worth mentioning that Yammer v1.3.1 DID NOT leave an entry in the registry regarding it being installed. Fortunately, Yammer 1.3.2 is out, and my testing shows the entry being there again. that is really strange .Could be that, the version might have changed how it leave the entries in registry but we have stopped deploying Yammer client as web browser provide more features and also much faster to use. Have any suggestions for App Detection Method? I have followed instructions and software will install but Software Center reports it as failure. I've tried different ways for detection method such as changing RegKey but no luck. Thanks! After the Install of Yammer on client PC,did you check if there are any entries in HKCU as per the guide ? If there are not entries then for sure detection method will fail. If there are registry entries about Yammer ,then you need to cross verify the detection rule with HKCU. you can also look at folder location %localappdata% . I've noticed that with 1.3.2, they have replaced the entry in the registry. Works great. Thanks for the document! Thanks for sharing. Will test out the deployment this weekend.